COATINGSPRO MARCH 2015 63 crew of fve followed directly behind. "Once the primer cured, we had to lay down the OneStep material in the same day. Te recoat window was defnitely a challenge," said Bradigan. ERSystems Single Ply Primer is a single-component solvent- borne primer designed to improve adhesion of coatings to a variety of roofng membranes. One of the frst major challenges of the job came during the application of the primer. 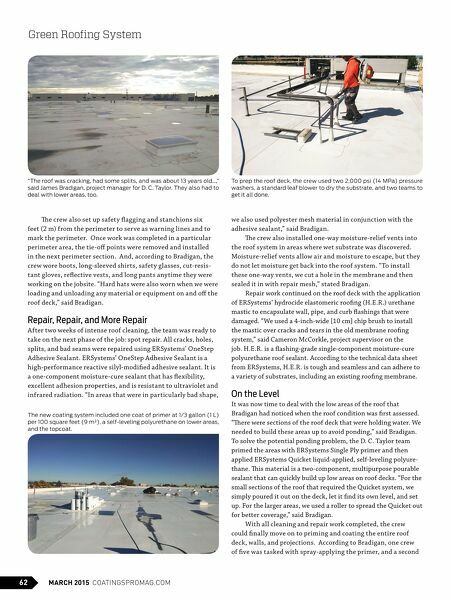 Te crew initially applied the Single Ply primer according to the manufacturer's recommended appli- cation rate of 1 to 1¼ gallon (4–5 L) per 100 square feet (9 m²). "With this application rate, it just didn't seem to be laying down properly. We talked with our ERSystems representative, and together, we decided to go to with an application rate of ⅓ gallon [1 L] per 100 square feet [9 m²]. After that, we had no issues with the primer application," stated Bradigan. Cold Front Approaching As the mild fall weather started to turn toward the brutal cold of winter, the crew was racing to fnish the job before the frst snowfall. And that wasn't the only challenge they were facing. Te falling mercury meant that the crew needed to heat the coating product so that it was at the correct applica- tion temperature. 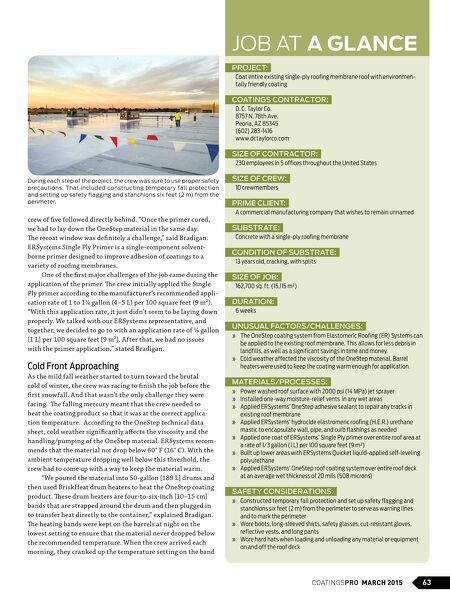 According to the OneStep technical data sheet, cold weather signifcantly afects the viscosity and the handling/pumping of the OneStep material. ERSystems recom- mends that the material not drop below 60° F (16° C). With the ambient temperature dropping well below this threshold, the crew had to come up with a way to keep the material warm. "We poured the material into 50-gallon [189 L] drums and then used BriskHeat drum heaters to heat the OneStep coating product. Tese drum heaters are four-to-six-inch [10–15 cm] bands that are strapped around the drum and then plugged in to transfer heat directly to the container," explained Bradigan. Te heating bands were kept on the barrels at night on the lowest setting to ensure that the material never dropped below the recommended temperature. W hen the crew arrived each morning, they cranked up the temperature setting on the band JOB AT A GLANCE PROJECT: Coat entire existing single-ply roofing membrane roof with environmen- tally friendly coating COATINGS CONTRACTOR: D. C. Taylor Co. 8757 N. 78th Ave. Peoria, AZ 85345 (602) 283-1416 www.dctaylorco.com SIZE OF CONTRACTOR: 230 employees in 5 offices throughout the United States SIZE OF CREW: 10 crewmembers PRIME CLIENT: A commercial manufacturing company that wishes to remain unnamed SUBSTRATE: Concrete with a single-ply roofing membrane CONDITION OF SUBSTRATE: 13 years old, cracking, with splits SIZE OF JOB: 162,700 sq. ft. (15,115 m²) DURATION: 6 weeks UNUSUAL FACTORS/CHALLENGES: » The OneStep coating system from Elastomeric Roofing (ER) Systems can be applied to the existing roof membrane. This allows for less debris in landfills, as well as a significant savings in time and money. » Cold weather affected the viscosity of the OneStep material. Barrel heaters were used to keep the coating warm enough for application. MATERIALS/PROCESSES: » Power washed roof surface with 2000 psi (14 MPa) jet sprayer » Installed one-way moisture-relief vents in any wet areas » Applied ERSystems' OneStep adhesive sealant to repair any cracks in existing roof membrane » Applied ERSystems' hydrocide elastromeric roofing (H.E.R.) urethane mastic to encapsulate wall, pipe, and curb flashings as needed » Applied one coat of ERSystems' Single Ply primer over entire roof area at a rate of 1/3 gallon (1 L) per 100 square feet (9 m²) » Built up lower areas with ERSystems Quicket liquid-applied self-leveling polyurethane » Applied ERSystems' OneStep roof coating system over entire roof deck at an average wet thickness of 20 mils (508 microns) SAFETY CONSIDERATIONS: » Constructed temporary fall protection and set up safety flagging and stanchions six feet (2 m) from the perimeter to serve as warning lines and to mark the perimeter » Wore boots, long-sleeved shirts, safety glasses, cut-resistant gloves, reflective vests, and long pants » Wore hard hats when loading and unloading any material or equipment on and off the roof deck During each step of the project, the crew was sure to use proper safety precautions. That included constructing temporar y fall protection and setting up safety flagging and stanchions six feet (2 m) from the perimeter.